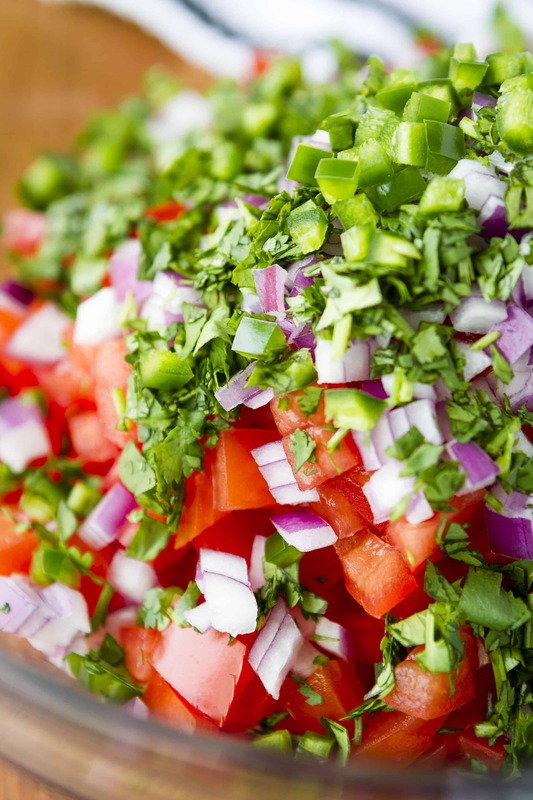 Sweet, juicy tomatoes, red onion for a little bite, cilantro, lime juice, and a little diced jalapeño pepper, plus a dash of salt are all you need for a deliciously homemade fresh tomato salsa… SO simple and packed with flavor! This easy, healthy homemade tomato salsa happens to be my favorite summertime recipe. Skip the store-bought seasoning packets and make this with fresh ingredients straight from your garden or farmer’s market. Our friends and family ask for it whenever they come over! 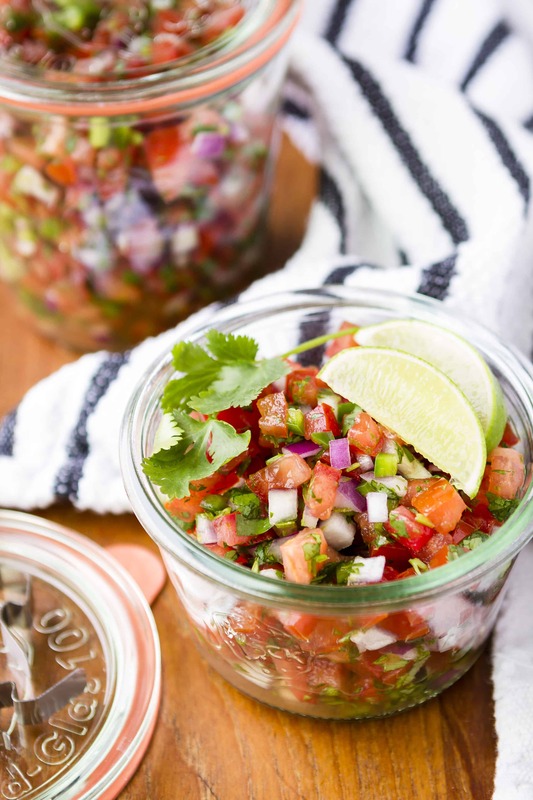 Pico de gallo, salsa fresca, or fresh salsa, whatever you want to call it, the BEST part about this recipe is it doesn’t require a lot of dishes or utensils. That’s especially important to me during the summer, because when it’s beautiful outside, the last thing I feel like doing is slaving over the sink. Actually, I could make a case for this ANY time of the year — but most especially on gorgeous summer days. To be honest, I don’t really have a fresh tomato salsa recipe, per se. It’s more about chopping and dicing and mixing, then a little tasting and adjusting until it’s just right. But I did write down how much of each ingredient I used the last time I made it to give you a starting point of reference. My number one rule for making fresh tomato salsa? Wear rubber gloves when dicing those jalapeño peppers! I made the mistake of not wearing them… and then I accidentally touched my lips. Ouch! And not only that, but then I rubbed my nose… Oh man, LESSON LEARNED! At the very least, wash your hands well after chopping them. I keep a bottle of Mrs. Meyer’s hand soap on my kitchen sink just for this purpose. It’s my favorite! Combine all ingredients in a medium bowl and mix well. Refrigerate for at least one hour to allow flavors to incorporate. Taste with tortilla chips when adjusting the salt to account for the saltiness of the chips. I typically start with 1/2 teaspoon and go from there. 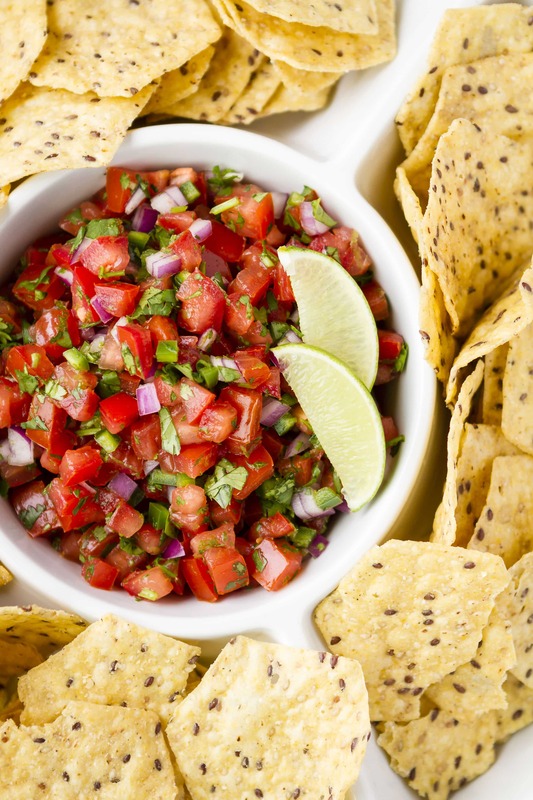 Serve this fresh tomato salsa with chips (try these homemade tortilla chips! ), on top of tacos, or spooned over scrambled eggs. *Add more jalapeño and/or toss in a few seeds if you want a hot salsa, or add less for more milder tasting salsa. The heat factor intensifies the longer the salsa sits. I’m thrilled to partner with Grove Collaborative as an affiliate. As always, all opinions are my own. Thank you for supporting the brands that make this site possible! I love fresh salsa and that looks like a mighty fine knife! I love this recipes! SO simple and packed with flavor! Yep, it’s also known as pico de gallo, salsa fresco (fresh salsa), and salsa mexicana. It’s delicious whatever you want to call it! Gorgeous photos! I love fresh salsa and that looks like a mighty fine knife! Fresh salsa ALWAYS beats out jarred! Yum! Everything tastes better with a big ol’ spoonful of fresh made salsa! I adore fresh tomato salsa! We love fresh salsa – a favorite snack in our house. And we love our Chicago Cutlery knives, could not live without them! I love homemade salsa! So much better than store bought! Yum! I can’t stand the jarred stuff since I started making it fresh. My version is similar to yours, but I add scallions & a bit of olive oil to mine. The scallions are very flavorful & the salsa always gets rave reviews. I always love a good salsa recipe! I had to laugh at your jalapeño story….I was chopping some this Saturday and managed to get the “juice” inside my nose. Can I just tell you that I thought I was going to die!!?? Incredible pain and burning that lasted for an hour! I will definitely wear rubber gloves from now on! !